This article describes the basis on which Panchangam calculations are made and the logic behind the determination of the almanac dates of birth, anniversaries as well as religious events. Calendar is one that describes a day and time on earth as perfectly as possible. Assuming the Earth to be at the centre of the universe, all celestial objects, the sun, moon and the stars appear to be on a big sphere around the Earth. This is an apparent sphere of course. But due to the distances of celestial bodies it can be assumed. In astronomy this is called the celestial sphere. Relative to the earth’s rotation around its axis the celestial sphere would be making one complete rotation around the earth, in the opposite direction, in 24 hours. The axis of rotation will be the same as that of the Earth. Corresponding to the earth’ poles we will also get celestial north and south poles at the points where the axis meets the celestial sphere. 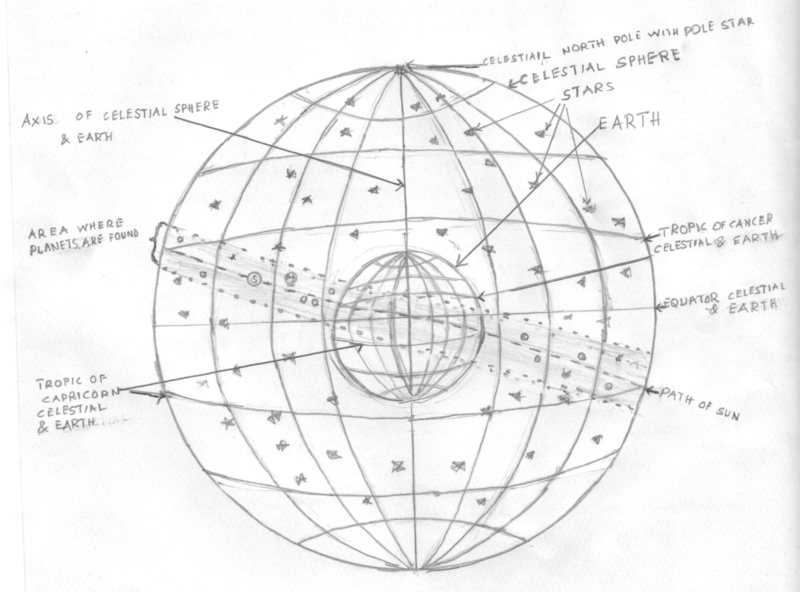 On this celestial sphere the stars are fixed in their positions. Though in actuality stars do move constantly, their distances from us are immeasurably great that relatively their motions are very diminutive and in the celestial sphere they are permanent in their position. Since their positions are fixed many shapes can be imagined by joining the stars. These are called constellations. The whole celestial sphere is divided into 12 equal stripes. Each stripe will have a range of 300 on sky. These stripes are named after the main constellations found in them. These are called the zodiacs. Hence we will get 12 zodiacs viz. Aries, Taurus, Gemini, Cancer, Leo, Virgo, Libra, Scorpio, Sagittarius, Capricorn, Aquarius and Pisces. While the stars are ‘fixed’ in their positions on the celestial sphere the planets move among them; that is through the zodiacs. This is due to earth’s rotation around the Sun and each planet’s rotation around the sun. The sun moves through the whole 12 zodiacs within a year, since the earth makes one complete rotation around it in that period. The period of time for the son’s movement between subsequent entries into the zodiac of Aries is determined as a year in the Tamil calendar. Of the planets Jupiter and Saturn, the two biggest and most influential on earth due to their gravity, come together in the same Zodiac once in sixty years. Hence in the Tamil calendar 60 years are identified and named. They occur in cyclic order. Each Tamil month is determined by the period the sun ‘dwells’ in each zodiac. The moon goes through the whole 12 zodiacs in just one month. It waxes to the maximum, ie full moon when it is in the opposite zodiac to that of the sun and wanes to the minimum, ie new moon when it is in the same zodiac as the sun. To describe the moon’s position better, the whole sky is divided into 27 ‘Nadchathiras’. Each ‘Nadchathira’ is actually a space around a prominent star. Each Nadchathira is again divided into 4 smaller parts which are called the Nadchathira Pathams. Each zodiac will have 2 1/4 Nadchathiras in it. The moon will roughly be in 1 Nadchathira each day. Each day is described (in addition to the month and year) by the Nadchethira, the moon phase and named in a cycle of seven after the ‘planets’ Sun, Moon, Mars, Mercury, Jupiter, Venus and Saturn. The earth is assumed to be stationary. The celestial sphere makes a complete rotation from east to west in a day or 24 hours. On the celestial sphere the sun moon and all the planets journey from west to east. The daytime is fixed as between sun rise and sun set. 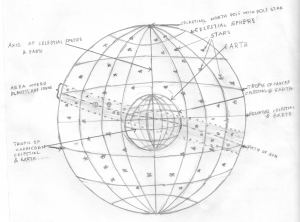 Since the sun moves from west to east on the celestial sphere, the celestial sphere with all the stars in it will rise earlier than the sun each day. As the sun makes one complete rotation on the celestial sphere, each star on the sky will rise with the sun once in a year. That means the stars will rise earlier than the sun by 24 hours in a year. So in one day the stars rise (24*60)/365 minutes, roughly 4 minutes early. The moon on the other hand will rise late each day as its eastward motion on the celestial sphere is more than 12 times as fast as the1 the sun. On the new moon day the sun and the moon rise together. So the moon will rise later than the sun by 24 hours between subsequent new moons. That occurs roughly in 28 days. So each day the moon will rise (24*60)/28 , roughly 52 minutes late. The movements of the planets on the celestial sphere are irregular. They show retrograde movement. Those planets which are nearer to the sun than the earth reverse their journey half way in addition to making many retrograde movements in between. The two planets, Venus and Mercury in this position are always either morning or evening ‘stars’. In the celestial sphere they are always within 3 zodiacs from the sun. Those which are further from the sun than the earth make a retrograde movement after entering a zodiac initially. This is because the movement of the earth around the sun is faster than these planets and projected from the earth against the backdrop of the zodiacs at infinite distance their positions go back into the former zodiacs soon after entering a new one. This will not happen if the planet is in the centre portion of a zodiac. For the fixing of time two more additional things, to that of a day are mentioned. One is the zodiac which was at the eastern horizon at that time and the other is the position of planets in the zodiacs. Thus mentioned the time will only be approximation for two reasons. First, each zodiac has a width of 300 on the sky and has duration of two hours for its complete rise over the horizon. Second each planet can exist in a zodiac for a long time (relative to minutes and seconds), sometimes for years. To rectify the first, by how many degrees (the angle between the western border of the zodiac and eastern horizon) the zodiac has risen above the eastern horizon is calculated. As regards the second, the position of the planets in the zodiacs should be further particularised to the Nadchathira pathams and précised to the degree or angle from the western border of the Nadchathira patham. While the fixing of a month by the Tamil calendar coincides with the sun’s position in a zodiac, the fixing of an annual day as well as religious events require an additional celestial occurrence, the moon’s position. When the moon is in the same Nadchathira on subsequent same Tamil month, then it is considered the annual day viz for birthdays, anniversaries etc. Done in this manner the Tamil calendar is more scientific, accurate and referring to the earth’s position in the universe rather than to any event that happened on the earth. Next Next post: பெரியபுராணம் என்பது ஏன்ன?